Today’s project is one I worked on when I was visiting my parents at their lake house. 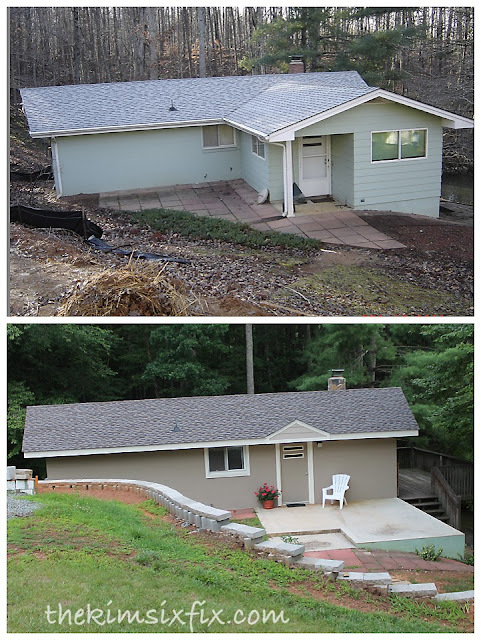 If you don’t remember, last summer we fixed up the boat house with a new paint job, and by finishing off the window trim. This summer my mom wanted me to build a simple bench for out front so that we would have somewhere to sit near the dock without having to walk all the way back up to the back porch of the main house. Previously she had a couple of cheap plastic adirondack chairs but they weren’t very practical and they were always blowing off the patio with the strong winds off the lake. My mom had some VERY SPECIFIC needs for this bench. It had to be simple (she wanted the clean lines to not draw focus to the boathouse), and it had to be water resistant, easy to clean, and wouldn’t rot. Because it would be used for wet people getting on and off the boat and coming out of the water, and because that area tends to grow mildew easily, she didn’t want the bench to be constructed from regular lumber. After recently installing a porch on the main house from compsite wood alternatives, she suggested I build the bench out of similar materials. The problem is that it isn’t as straight forward as that. The most famous brand of composite material is probably Trex, which is the industry leader and mostly known for it’s decking materials. But there are other brands as well, also used for decking and house trim, including MiraTEC which is the same type of composite product (made up of recycled wood fiber and plastic) and PVC products such as AZEK and KLEER. Of course these materials come in extremely limited sizes and are not intended for construction, so I also needed to include some pressure treated lumber for added strength and support. I used Ana White’s Rustic X Bench as my jumping off point but got rid of the cross supports, since they were only decorative. I had to switch from using 1x3 to using 1x4 since that is the only width the MiraTec was available in. I also want to point out that since they are trim boards, and they are composite you have to BE AWARE THEY ARE DIRECTIONALLY SIDED!! One side has faux graining while one side is perfectly flat, like MDF. 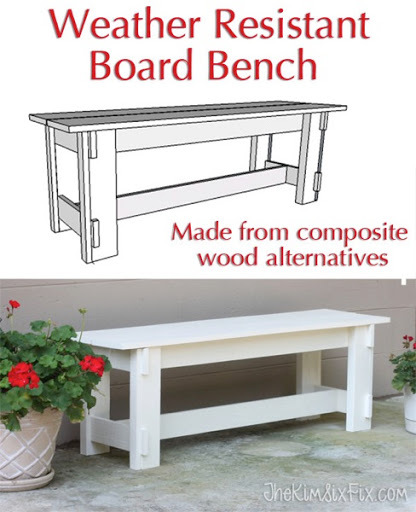 So when you put this bench together you need to decide which is the front and which is the back and face all the boards the same way. First you need to notch all four legs so that you can mount the stretchers flush. This is probably the most intimidating part of this build, but trust me.. it isn’t that bad. I used a band saw to make the notch cuts, but using a jig saw or even a table saw would work as well. Kreg has this great explanation of how to make the cuts with only three passes of the jig saw. Next you need to add trim boards. Since MiraTEC doesn’t come in anything smaller than a 1x4, I had to use AZEK 1x2s for this part of the project. I attached them with a nail gun since they are only decorative. Now we are moving on the seat supports. I once again used MiraTEC 1x4s and screwed them into the pressure treated 2x4s at the ends. Since MiraTEC has a lot of flex to it, we will need to add additional cross bracing. I also added a stretcher on the bottom of the bench, like in Ana’s original design, but instead of screwing into the end of the boards (which is a sure fire way to damage them) I drilled a set of pocket holes on each end with my Kreg Jig. This is a much stronger joint and because you are drilling though the outside surface of the MiraTEC and not into the end of the board, you won’t damage it or cause it to crack. The other nice part about the pocket holes is that there are no exposed screw heads from the side of the bench. I admit it is a little “Franken-bench”-like, made up of all different colors and styles of material, but trust me.. it will come together. For this I used regular pine board since I had them lying around. You could use pressure treated lumber for this as well, but because it is under the seat and not exposed to the elements I wasn’t sweating it. Once again, I used pocket holes to attach the support boards. I typically would use my K4 jig, like in my other projects, but since I was at my parents house they only had the R3. It is really simple to use as well. This was my dad’s first time using the jig and I could tell he was impressed with how easy it was. To attach the braces I used the 3/4 inch setting on the jig and used 1-1/4 inch screws. I spaced them out evenly. I also pre-drilled holes in them which I used to attach the top boards. To attach the top boards on the legs I added a few L brackets. I could have used pocket holes here, or even drilled them in from the top, but I wanted the finished top to be clean and I didn’t want to damage the boards and give water a place to get in. Instead of the single 12 inch wide board in Ana’s original design, I used 2 1x8s (made of AZEK) with a 1/4 inch gap between them, which will make it easier for water to drain. A perfect simple addition to the front of the boat house, and because it is made of all these materials, it should stand the test of time.